Supported We Hang In There! THIS AMAZING ROCK FORMATION IS CALLED “CHAPEL ROCK. 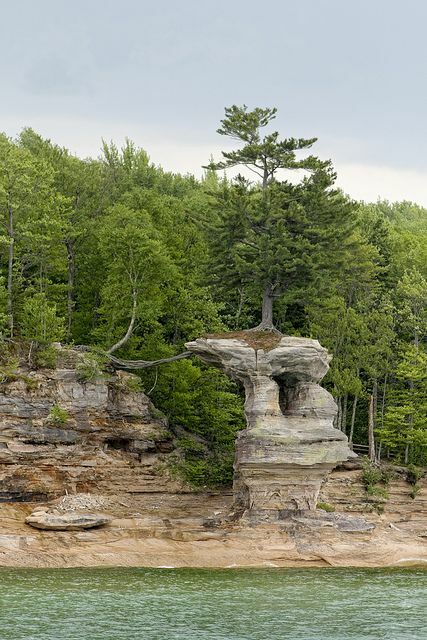 THE TREE YOU SEE ON THE ROCK IS ONLY KEPT ALIVE BY THE ROOT BRIDGE ON THE LEFT. When times get tough, as they sometimes do, we all need a lifeline, something or someone to help us get through. At present I know a very special lady who is struggling and am sending her lots of prayers and love. Her strength is coming from her family and the many wonderful friends she has made over the years but in the end in the toughest times even more is needed. I have been meeting a lot of people lately who have been doing it tough and it really starts you thinking. When looking at times when we are alone and no other person can share a path we must walk alone you need a strong inner belief that life is taking you exactly where you are meant to be and that all is unfolding just as it meant to. Then you can settle, find peace and acceptance of the present situation knowing that this too will pass, it is impermanent and as everything does will change. Often this takes a strong faith! “You need a deep well in times of drought!” was how the Dalai Lama put it during his teachings in Melbourne. This faith doesn’t belong to any culture. He went on to say “If I had been born in Australia I would probably be praying to that nice lady in blue (Meaning Mary the mother of Jesus) His point was that we have different religions because of our birth place, heritage, cultural beliefs and this is not to create barriers between us but to make it easier for us and allow for our differences. Some find their strength in Christ’s teachings, some in Buddha’s and some in other faiths, the important thing is to find that strength and how to tap into it BEFORE things get tough because then it is easier to hang in and find the inner strength and peace to make the journey easier. These tough times often bring amazing blessings! They come to us in many surprising ways but they almost always come to us through the love given out by others. It is a gift we can all give, it costs nothing but a little time to send loving thoughts and in todays tough world we need all the love and compassion that can be given. If you know someone who is doing it tough and you want to help but don’t know how start by sending them loving thoughts. If you are doing it tough just open your heart and accept all the love that is being poured out daily by many loving souls who know that everyone has a special unique place in this world and that love unites us all.